Food and drink wholesale is a critical part of the British economy. Food and drink wholesale distribution is a sector in its own right, turning over £29 billion, employing nearly 60,000 people and generating gross value added of £3 billion annually. Wholesalers’ depots are located in all regions and devolved nations to distribute goods to independent retailers and caterers in local communities. There are a number of issues which pose challenges to the future success of the sector including the impending exit from the European Union, food inflation and the automation of manual roles. FWD are already working, along with our businesses in the sector to ensure that we and the sector are well placed to manage the challenges posed by Brexit. One of the really key challenges for our labour intensive industry will be ensuring a good and skilled workforce. Many wholesalers employ high number of European Migrant workers. It will be critical to us to ensure this supply of labour. Over 90 per cent of the value of direct purchases by food and drink wholesale distributors are from suppliers in the United Kingdom. However, the food and drink manufacturers that they purchase from import a much larger share of their goods and 70 per cent of their imports come from the European Union. As such, the sector would be best served by a comprehensive trade deal after Brexit which keeps tariffs or trade barriers to a minimum. If there is no deal agreed between the United Kingdom and the European Union and trade is conducted under World Trade Organisation rules it will be essential to ensure tariffs imposed under these rules aren’t overly burdensome. The sectors which they will affect most are related to food, drinks and tobacco. If a free trade agreement is not reached then the food and drink wholesale distribution sector will face further upward pressure on their suppliers’ prices. April 2: The Agri-Food Chain Stakeholder Engagement team at Defra has shared seven key food, drink and agriculture related government communications that have been released in recent days and weeks. March 22: The Food and Drink Federation has produced one page guides for food and drink importers and exporters. These documents set out five essential steps to ensure your business is ready to import from and export the EU in the event of a no deal Brexit. 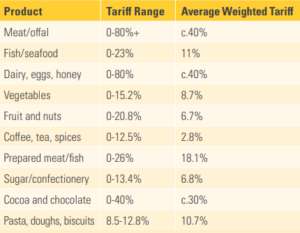 March 13: The Department for International Trade has published the long awaited tariffs in the event of no-deal with the European Union. The government has attempted to keep tariffs as low as possible except where necessary. For many key oil imports, such as jet fuel and biodiesel, tariffs have been set at zero, whilst palm oil will have tariffs. 87% of all goods entering the country would face zero tariffs, with import taxes remaining for only 13% of incoming goods. The plan is temporary (for up to 12 months) and as expected excludes a selection of agricultural products to protect farmers such as beef, lamb, pork and some dairy, as well as car imports. This is seen as the most balanced approach in the current situation. Tariffs would apply from 11pm on 29 March in the event of a no deal. March 6: The Government has released specific information for food and drink companies preparing for a possible no deal Brexit at the end of the month. February 22: Preparations for a No Deal Brexit across business, Government and trade associations are increasing. In recent weeks FWD has been heavily engaged in this work. The outcome of Brexit discussions are still highly uncertain. Momentum is gathering for a delay in the Article 50 deadline for leaving the EU, due to be triggered on March 29, but this may not be decided until the middle of March. The next Parliamentary vote is scheduled for February 27, at which point things may be clearer. Earlier this month FWD had a meeting with the Food Minister David Rutley and as a follow-up last week we hosted a meeting for members with senior officials from Defra and DExEU to discuss No Deal planning. Although the officials said they are not expecting No Deal, it remains a strong possibility and it will have a major impact should it happen. No Deal preparation is the Government’s principle operational focus at present. Among the items under discussion at the meeting were: imports and exports and disruption at the borders, continuity of supply, tariff rates (not yet published), labelling, vulnerabilities in the supply chain, supplier allocations, supplier price increases, public sector contracts (preparedness, cost impacts, substitutions) and labour issues. If you would like any information on any of these areas please let us know. FWD was a signatory to a letter to Michael Gove requesting to pause all non-Brexit consultations. In his reply the Secretary of State agreed to pause some consultations aimed to extend others to 12 weeks. None will conclude before mid-May 2019. He also agreed to use his influence to look at other consultations across Government. News on the decision surrounding tariffs in the event of a No-Deal Brexit is expected imminently. There is a split in Government between those who favour low food and drink tariffs such as Chancellor Philip Hammond and Liam Fox, and others such as Michael Gove who want high tariffs for particular industries at risk from imports from Third Countries such as meat and dairy. Defra have published guidance on the changes to food labels if the UK leaves the EU without a deal. The Guidance says that a statutory 21-month transition period has been agreed (ending 31 December 2020) to give businesses more time to make labelling changes for the UK market (e.g. FBO name and address & new UK health/identification marks). For other more immediate label changes (e.g. origin labelling & EU organic logo), Defra will encourage a pragmatic approach to UK enforcement throughout the 21-month period. The Guidance also advises on the anticipated treatment of goods placed on the market before and in the event of a No Deal Brexit. For food products already placed on the EU/UK market on or before exit day, these may continue to be sold through until those stocks become exhausted. The Government has set out provisions for EEA citizens and their family members arriving in the UK after we leave the EU under No Deal. In this scenario, the Government will end free movement. There will be a transition period until the UK’s new skills-based immigration system is introduced at the beginning of 2021. Permission to stay in the UK will be granted for 36 months leave to remain. Those who wish to stay for longer will need to apply and qualify under the terms of the UK’s new skills-based immigration system, which will begin from 1 January 2021. Employers already conduct Right to Work checks on EEA citizens and that will not change. They do not have to differentiate between those who are resident in the UK before exit and those who arrive afterwards. Until the new skills-based immigration system is introduced, EEA citizens will be able to evidence their right to work in the UK by using a passport or national identity card, as now. February 18: The Government is concerned about how prepared businesses are for No Deal, particularly the food and drink industry, although they appreciate that planning for No Deal is not a straightforward process. A series of Technical Notices has been produced with information about what to do to plan for No Deal across multiple business areas. Information can be tailored so relevant business documents are highlighted. The process allows you to identify yourself as a food and drink wholesaler and whether you directly import or export, employ EU workers etc. Most of the documents have now been published, although there are some crucial gaps, for example on tariffs – which are due “imminently”. Defra is also keen to highlight the HMRC partnership pack, which provides information on how to prepare for No Deal. February 4: HMRC has published advice for UK businesses that trade only with the EU, with details of important actions they need to take and changes to be aware of in the event of the UK leaving the EU without a deal. FWD met Food Minister David Rutley prior to January 29th’s amendment votes. The Minister stressed that No Deal remained a very real prospect. He urged all wholesalers to continue with their Brexit No Deal preparations. Mr Rutley said Government were working with business to help No Deal planning but if any wholesalers were unclear about what they should be doing to let FWD know, as the Federation had a direct route to officials leading on No Deal planning. Mr Rutley also said that potential post Brexit tariffs would be published “soon” and that the plan was for “low to no” tariffs on food wherever possible. In December FWD hosted a roundtable for wholesalers and senior officials from DexEU and Defra to discuss Brexit, and a further meeting is planned for this February. This is the agreement between the UK and the European Union on how the UK will leave in March 2019 and what will happen during the transition period. It is during the 21 month transition period from March 2019 that the UK and the EU will negotiate a formal free trade agreement. This is not included within the Withdrawal Agreement. A commitment to the UK maintaining environmental standards after it leaves the EU. The UK Parliament is expected to vote on the Withdrawal Agreement in December, but with current indi- cations being that the Government will fail to secure a majority on this deal, businesses should continue to plan for a No Deal scenario. October 13: The Government has also appointed David Rutley as Minister for Food Supplies in Defra to oversee the protection of food issues through the Brexit process. There will be significant changes to food labelling as an EU address alone would no longer be valid for pre-packed products sold in the UK market. Similarly, a UK address alone would no longer be valid for the EU market and an address within the remaining EU member states will be required following EU exit. From April 2020, the country of origin or place of provenance of the primary ingredient of a food will be required on labels as part of EU rules on food labelling. The Government may apply similar national rules in the UK when EU rules no longer apply. In the event of no deal, UK hauliers can no longer rely on automatic recognition by the EU of UK-issued Community Licences. The Government has introduced a new Haulage Act to enable the delivery of new systems for road haulage under no deal. The Government has also ratified the 1968 Vienna Road Traffic Convention, for UK licence holders to continue to drive in the EU if there is no deal. The UK will be a third country for EU member states. This means that to travel to the EU, a person will need to go through a third country procedure for Schengen processes. These procedures limit a person’s stay to 90 days and require that a person has a passport that is valid for not shorter than three months after the final point in which they could stay in the EU. The Migration Advisory Committee has published its final report looking into European Economic Area migration in the UK, giving the MAC’s conclusions and recommendations for the UK’s post-Brexit work immigration system. The MAC is an independent body of experts whose job is to advise the Home Office on migration. The purpose of the report was to outline the sectors who rely on EU labour, and to look at the current free movement of labour. The report suggests the same visa requirements for workers from the EEA as other migrants to the UK, and scrapping limits on higher-skilled migrants to the UK, as well as the system being extended to mid-skill roles, so a degree would no longer be required. With regard to low-skilled workers, the MAC says it is “not convinced there needs to be a work route for low-skilled workers” from the EU to fill jobs in industries such as catering or hospitality. December 13-14 is the last date for an Article 50 divorce deal to be signed off by Britain and the EU. By January/February 2019 the House of Commons have to approve whatever Brexit deal that has been agreed and MPs must also pass a Withdrawal Bill that puts the exit treaty into law. Until March 29 2019 the Withdrawal Agreement will need to be supported at an EU summit by a large majority of Member State leaders and the decision must also be approved by the European Parliament in a vote. March 29 2019 is Brexit day. On March 30 2019 trade talks will begin between the UK and the EU and the transition period will start. The transition period is scheduled to end on December 31, 2020.